Added a section about ‘fake watches’. Changed all versions from ‘version=3’ to ‘version=4’. Added a section about ‘merging uversionmangle and dversionmangle’. Writing a good watch file for a Debian package is simple. However, several maintainers don’t know how to make watches for non trivial sites as Google Pages or Github. Then, my objective is teach a bit about debian/watch. PS: to get a summary about Perl regular expressions, go to the site http://www.cs.tut.fi/~jkorpela/perl/regexp.html. 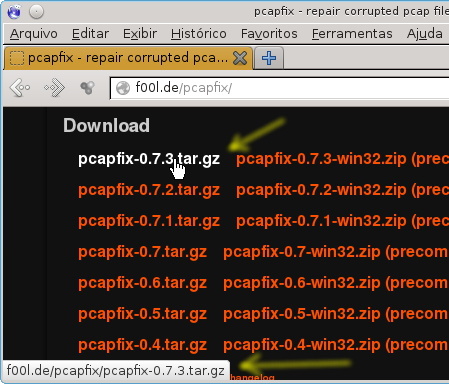 Is possible to see the web link f00l.de/pcapfix/pcapfix-0.7.3.tar.gz and we will try to use it. We should change the version from 0.7.3 to (.+). In Perl regular expressions, . * is treated as anything, except newline, one or more times. Then, we want monitor pcapfix-ANYTHING.tar.gz. The brackets are used to alert the watch system that we are considering as version what can be seen among them. The final situation is http://f00l.de/pcapfix/pcapfix-(.+)\.tar\.gz. Note that the last part (after the last slash) has a regexp and the points was protected by backslashes to avoid an interpretation as any character. PS: Some people like to use (.*). However, in regular expressions, this is treated as nothing or anything. Then, http://f00l.de/pcapfix/pcapfix-(. *)\.tar\.gz will match with pcapfix-.tar.gz and you should avoid this. To test a watch file, we need run ‘uscan command’ from upstream code place (outside of the debian directory, but it must exist; debian/changelog and debian/watch are fundamental to test because uscan will get the local version from the first and compare with results generated by the last). How you can see, all versions were shown and the package is using the lastest release. This was a very easy work. However, we can use another technique, which is more sophisticated. This technique is useful for sites more complex as Google Pages and Github. 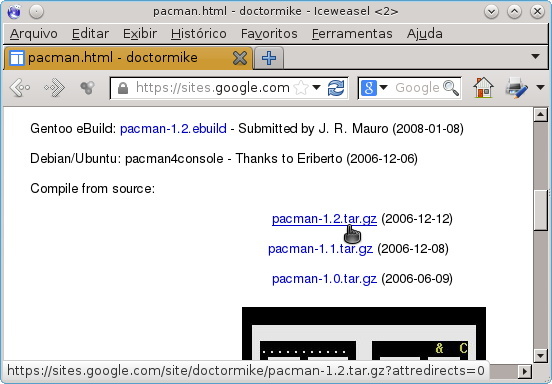 PS: these examples are available in plain text at http://eriberto.pro.br/files/debian_watch_example.txt. 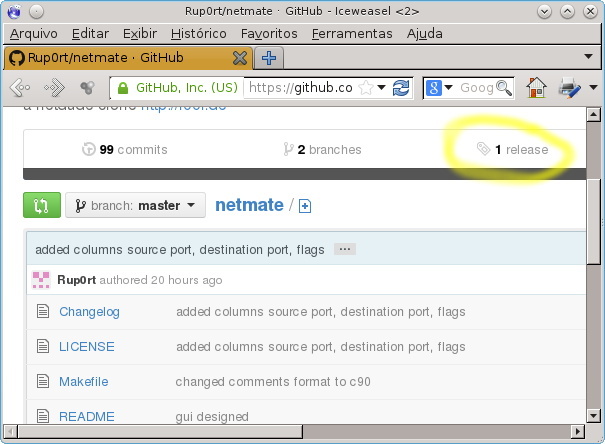 To Github, I will use as example the project homed at https://github.com/Rup0rt/netmate. In Github, there is a link named release. See the picture below. PS: remember that you must use ‘https://github.com/Rup0rt/netmate/releases (. *)’ for initial scan. As a new example, go to the site http://eriberto.pro.br/files/myprogram. Consider that you need to check all Linux versions and they are using tar.bz2, tar.gz and tar.xz extensions. Thus, you need to create a rule with a non-capturing group (? :) feature. You can see an example of this below. Note that was used (?:diskscan-)? to make diskscan- optional in results. The \d mean ‘one digit’, as 0-9. Finishing, you can see and test several examples of the debian/watch at http://anonscm.debian.org/viewvc/sepwatch/trunk/watchfiles. As said, the site http://www.cs.tut.fi/~jkorpela/perl/regexp.html has an overview about regular expressions. A special attention must be destinated to \d and \S matches because it is very used in watch files. The uscan manpage also has several examples and explanations. There are some important information at https://wiki.debian.org/debian/watch too. The post http://stackoverflow.com/questions/3512471/non-capturing-group explains about non-capturing group feature in Perl regular expressions. Another example of this is at http://deadlytechnology.com/web-development-tips/perl-regex. A good tip is the URL http://www.regexe.com, where you can test the results of the your Perl regular expression. Alternatively, there is http://www.regexplanet.com/advanced/perl/index.html but I prefer the previous link. I hope this help someone to write his debian/watch files. Fake watches are very easy to use. You can see how to use my fake watches here. There are some comments here. It’s had another option to use watch, also to use a debian service know Githubredir. Githubredir is repository redirect of Github. I think that is unnecessary because your text is excelente. If somebody want use, it’s cool. For example, my fortune-marios package. Please note that the regex pattern “(. *)” matches the empty string; so, a pattern like “pcapfix-(. *)\.tar\.gz” will match the string “pcapfix-.tar.gz”. That’s not desirable. Fortunately, the solution is simple: in the pattern, instead of zero or more characters, require one or more: “pcapfix-(.+)\.tar\.gz”. The ‘uscan(1)’ manpage and other documentation avoids “. *” and similar patterns for exactly this reason. Can you please update your article to avoid “(. *)” and instead use “(.+)” in the patterns? Thank you for helping maintainers use the tools correctly! You are right. Since I wrote this article I changed my concepts and I use \d\S+ now. I will update the article soon. Hi all. I made a general review in the post now. Thanks!